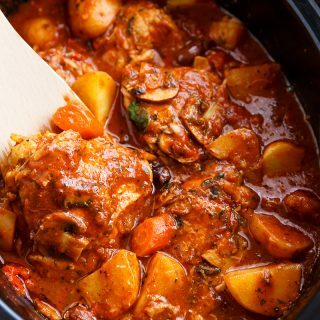 Slow Cooker Chicken Cacciatore With Potatoes is personally one of the most easy but most flavoursome recipes I’ve made! 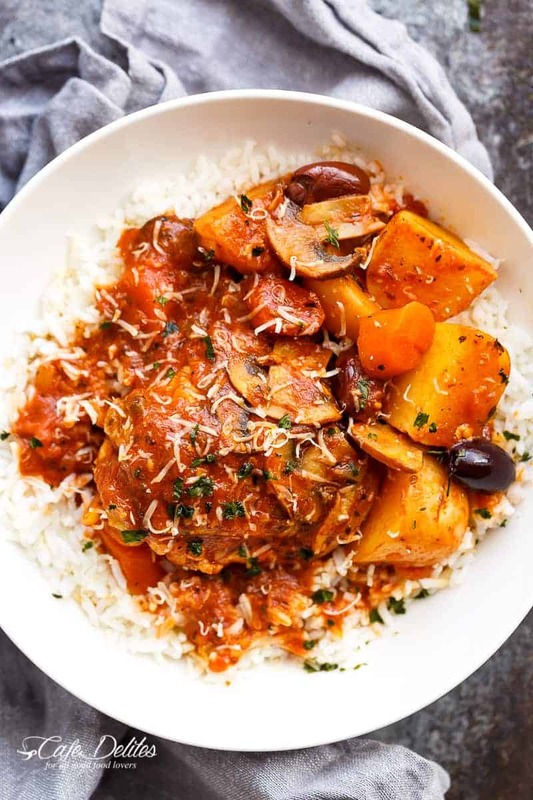 Cacciatore means hunter in Italian, and alla cacciatora translates to a ‘hunter-style’ meal or stew with chicken, onions, herbs and vegetables, all simmered down in a thick and rich tomato sauce, until the chicken is falling off the bone. 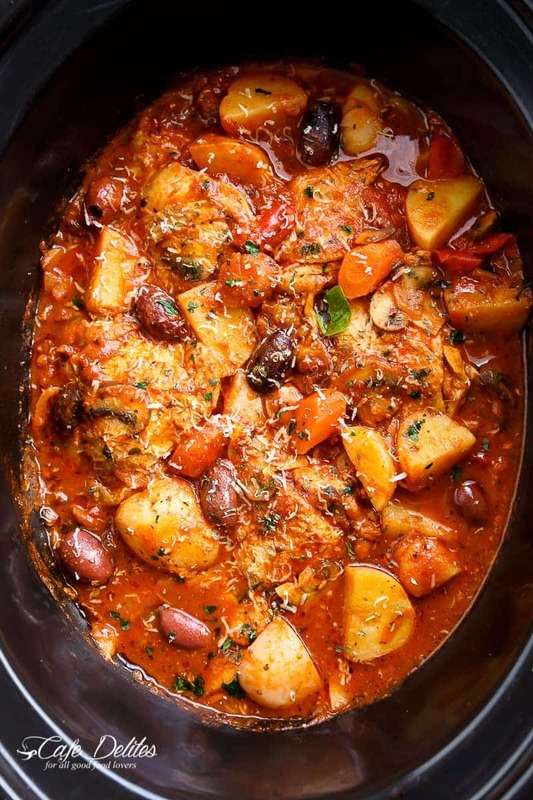 A step up from my popular Chicken Cacciatore recipe, THIS Cacciatore has the added bonus of baby potatoes AND is so easy to make! No baby sitting a pot over the stove required because it’s all done in your slow cooker! Included in this recipe is the option to browning the chicken first. Personally, I love searing any meat before adding it into the slow cooker, for added flavour. BUT! You don’t have too! Especially if preparing this before work and rushing out the door 20 minutes late with one shoe in hand…..never mind. Once it’s all done, serve over pasta, steamed vegetables, spaghetti squash OR rice (um….sorry). 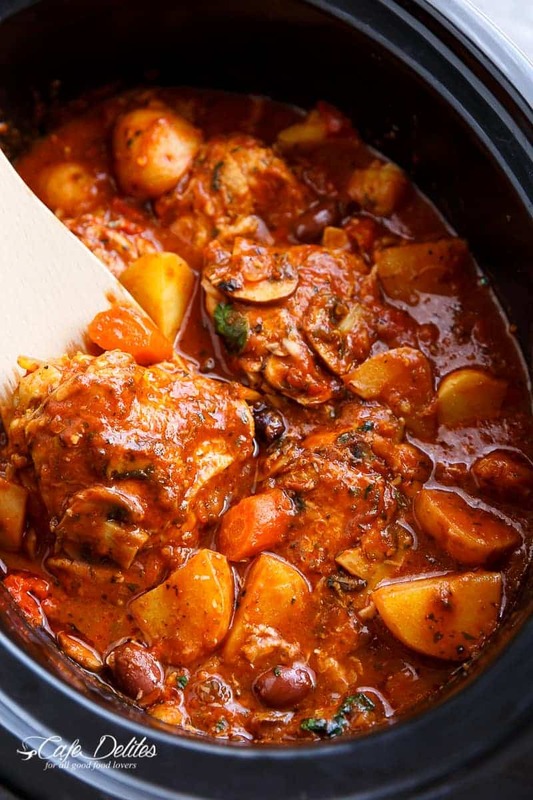 Slow Cooker Chicken Cacciatore With Potatoes is an EASY weeknight dinner that cooks itself! With chicken falling off the bone in an Italian stew! *Substitute crushed tomatoes for the tomato passata or puree if you can't find it. This was delicious! Skipped the browning step and followed the recipe exactly. 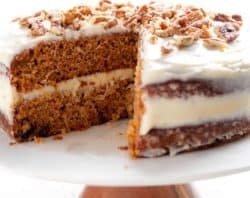 This is the 4th recipe I’ve tried this week from this website & I haven’t been disappointed by one! Your website makes me look like I know what I’m doing! How long would you cook this in the Instant Pot please? 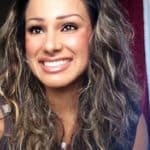 I love your recipes and the pictures are beautiful. 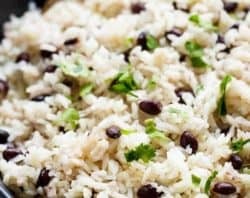 Please giv the instant pot instructions for this dish. Trying this now. 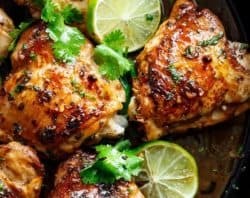 Possibly a silly question, but are the 2 tbsps of olive oil to brown the chicken, or does that go in the Crockpot with the other ingredients? 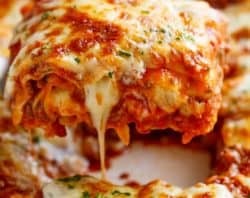 I loved this recipie! Thank-you! I tried it the first time in the crockpot and am trying it tonight in the instant pot! 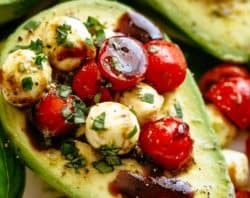 Would this recipe work using a large / electric roasting pan instead of a crock pot? I’m doubling the recipe and my crockpot isn’t big enough. If yes, how long should I cook it for? This looks delicious! Could I use chicken legs instead? Yes, that sounds delicious! You are welcome to alter any of my recipes to make your own. In some cases it may change the baking time and the way the recipe turns out. Hope you enjoy your chicken with potatoes! Do you need to add both the 400g crushed tomatoes and 400g passata to the pot or is it an either or option? It’s not clear in the recipe. Many thanks for another great recipe! Yes, you will want to add both of them. Thanks so much for following along with me! Enjoy your meal! OH no! I am sorry it was watery. I am not sure if it didn’t get hot enough for it to thicken. I am glad that the flavor was still there. Mmm sounds great Robert! Thank you so much for sharing your feedback! Yum! I’m so happy to hear that. Thank you for your feedback! 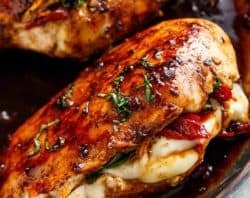 Can you make this recipe with chicken breasts as well? This was incredible and leftovers were even better, Thank you! Do you need to add both the 400g crushed tomatoes and a 400g passata to the pot or is it an either or option? It’s not clear in the recipe.